My oak tree has ridged, knobby, sticky looking formations on the acorns. They’re pretty odd looking and make me wonder what’s wrong with my acorns. As with every earth shattering question, I went directly to the internet to find out why my acorns are deformed. 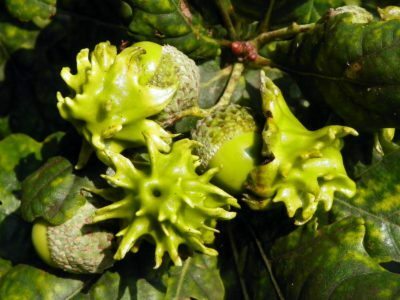 After Googling ‘what causes deformed acorns on oak trees,’ I came across something about knopper galls on oak trees. After reading through the knopper gall information, I’m pretty sure I’ve found the culprit. If you, too, have ever asked, “What’s wrong with my acorns,” then this is the most likely culprit. Knopper galls are caused by a Cynipid gall wasp, which is actually rarely seen. The wasp (Andricus quercuscalicis) lays eggs within the tree buds. Found on the pedunculate or common oak tree, these galls may be found on the foliage, twigs and acorns. The name ‘knopper galls’ is thought to come from the old English word ‘knop,’ meaning a small rounded protuberance, stud, button, tassel or the like, and the German word ‘knoppe,’ which refers to a kind of felt cap worn during the 17th century. At any rate, my galls look rather like green, sticky walnut meat. Yep, I think I’ve discovered what causes deformed acorns on oak trees. Why are My Acorns Deformed? So after reading a bit, I found out that knopper galls on oak trees usually present as an abnormal tissue growth or swelling on the acorns, twigs or leaves. Check. It starts out when the wasp lays its eggs in the bud. The tree’s reaction is to increase the production of its growth hormones. This makes the growth and development of the nut, or acorn, go a bit haywire, resulting in these wavy, knobby formations. In turn, the gall protects and feeds the gall maker – which, in this case, is the wasp larva. 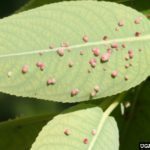 The galls are usually seen from spring to summer when the wasp is actively laying eggs. Although the galls have a negative effect on the reproduction of the tree, they don’t harm the overall health of the oak. Therefore, no treatment is required.